Have you had your first home grown strawberry? Several people I know have, but mine are still not quite ready. Here’s something that will interest you if you have a glut of strawberries! I love making strawberry jam. It’s one of our family favourites. Good for on a pieceof bread and butter or in between a victoria sponge! Sample the fruits of your labour this summer with a tasty strawberry jam recipe created by Haskins Garden Centre with tips on how to grow your own. 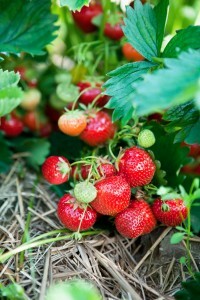 Strawberries are easy to grow and it’s the perfect time to get planting as the British climate heats up. The fruity berries can be harvested from borders, growbags, containers or hanging baskets – they just need plenty of sun, shelter and fertile, well-drained soil. Step in to summer with this strawberry jam recipe which will make enough for one jar. Strawberry jam is the perfect accompaniment to a sandwich, scone or cake. Keeps for 1 year – store in the fridge once open. If the surface of the jam contains too much froth, stir in the butter to reduce.